For this trip the plan was to fish multiple turns, holes, basins and flats to really break it down – we were ready! 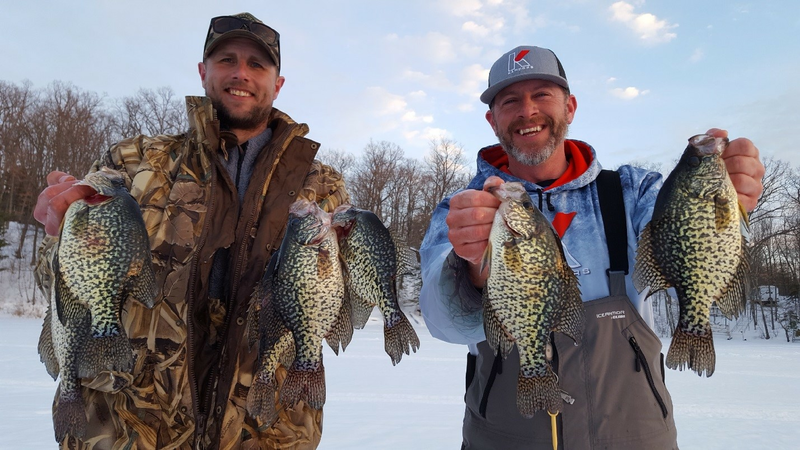 In no time we found that 20 mph easterly winds and nearly 18 inches of fresh snow were more than we had bargained for, so we decided to focus on the Eastern shore lines where we could get away from the wind until we located fish. 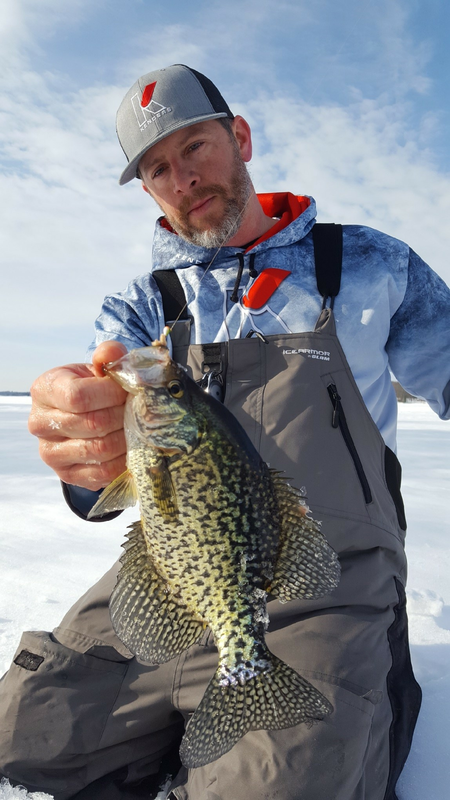 On one occasion prior we had found very healthy weeds that led us all the way out to 20 feet of water, and Crappies were roaming the weed edge between 14 and 18 feet. The morning was good. The Crappies were aggressive and it felt like no matter what we put in front of them, they were eating. Kenders 4 & 5 mm Tungsten Jigs loaded with 3 larva or large plastics were producing some pretty nice fish. My personal combo was a Kenders Tungsten 4 mm Baby Bass Bright UV with a #10 hook and a Maki Mino XL. As the day went on we continued to mark fish, but many were window-shoppers and the bite literally shut off. The predators moved in and our Crappies spread out. We stripped our plastics and found that downsizing to a single larva was tantalizing enough to get those fish to bite. Downsizing as the day went on was key to triggering a tough bite. It goes to show that even during bluebird skies in the middle of the day you can #katchfish! We will be back Wisconsin!